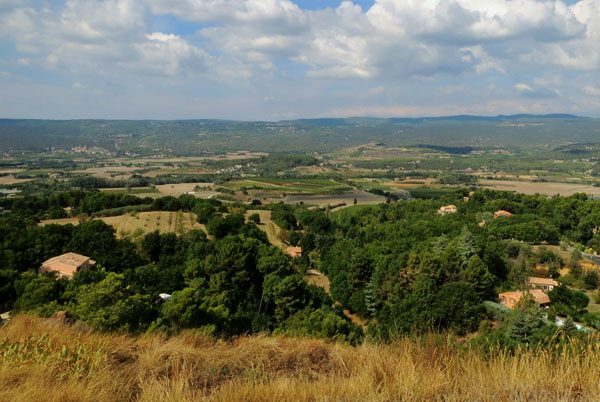 Charley and I just returned from hosting three Luberon Experience groups in Provence. 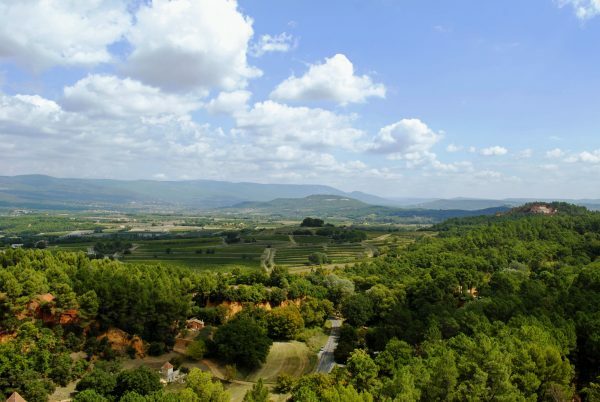 We do love the early autumn weeks in the Luberon! The weather this year was perfect: sunny and warm. We enjoyed leisurely lunches outside, and most days by mid-morning we didn’t even need our jackets. 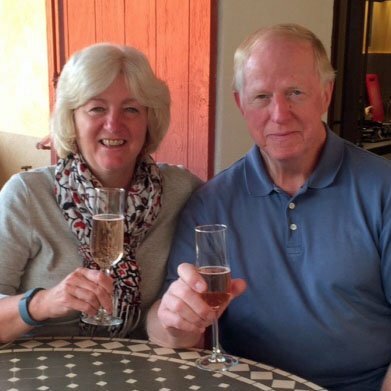 When we arrived in mid September, the wine harvest was wrapping up in our area. We saw some pickers in the fields, and we passed tractors pulling trailers filled with freshly-harvested grapes. 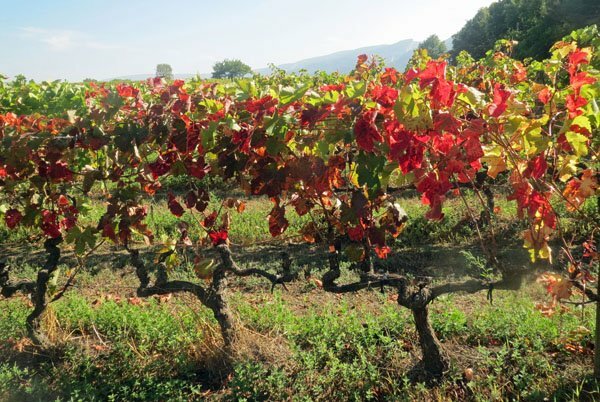 As we turned the calendar page to October, the autumn colors began to spread across the vineyards. 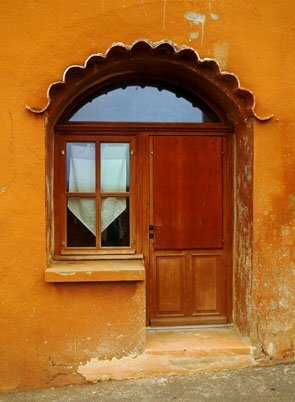 The distinctive colors of autumn… red, orange, yellow, gold, and brown… remind me of a very special place in Provence: the unique village of Roussillon. 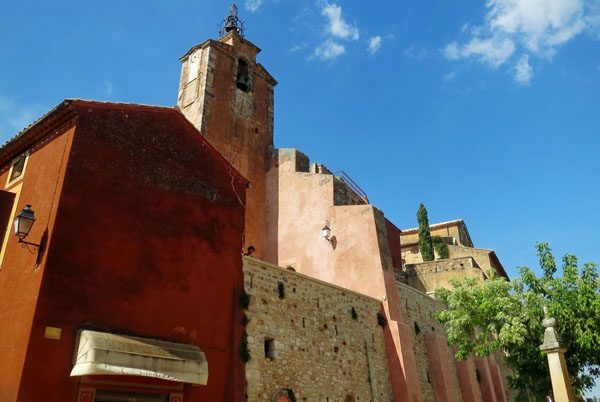 Our groups spend a memorable afternoon in Roussillon during our week. 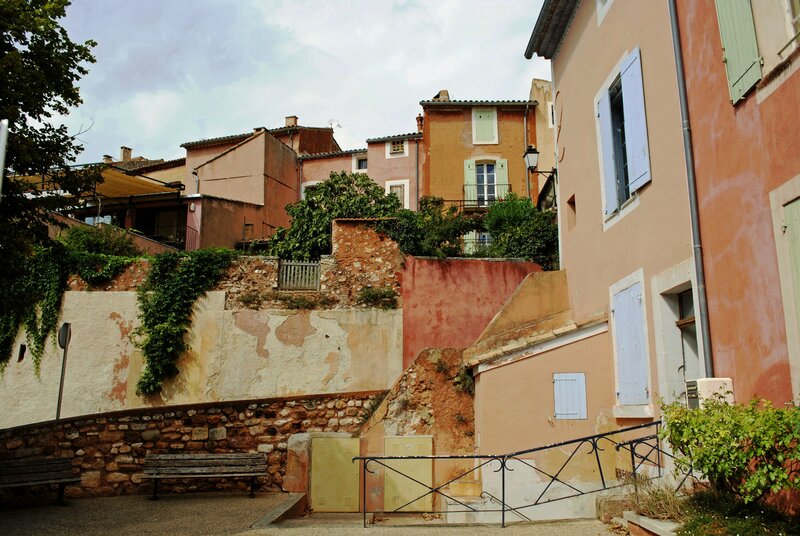 In mid-summer, Roussillon is often filled with tourists. (It’s popular for very good reason.) We like visiting in the “shoulder seasons” of May and September when we can wander around the village without the crowds. We especially enjoyed Roussillon on our recent early-autumn afternoons. 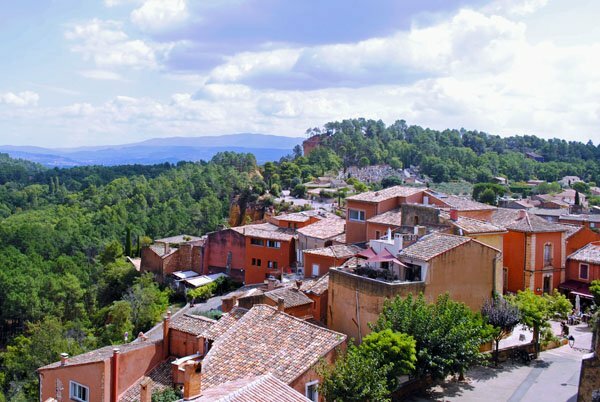 Roussillon sits on a hilltop in the middle of the Luberon valley, enjoying views in every direction… of the Luberon mountains to the south and of the Vaucluse Plateau to the north. On a very clear day you can even see the white peak of Mont Ventoux to the north. 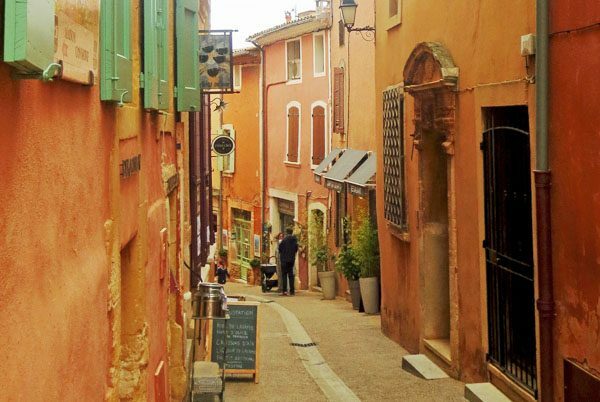 There’s much to like about Roussillon: textile and clothing shops, artist galleries, gourmet food and wine shops, restaurants, cafes, and ice cream shops. Several hiking trails and biking routes pass through the village. 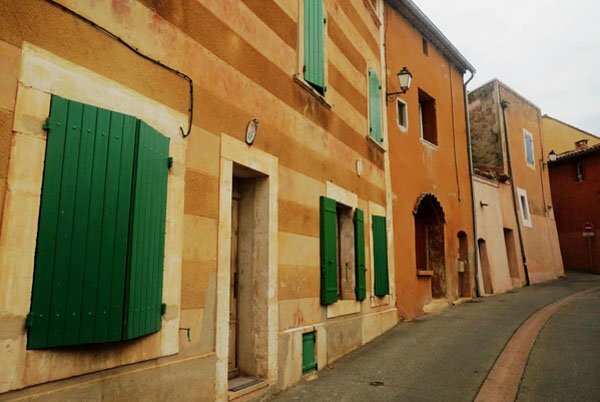 Although it’s a small village of just 1265 residents, there are many second homes, rental houses, and a few hotels and B&Bs. 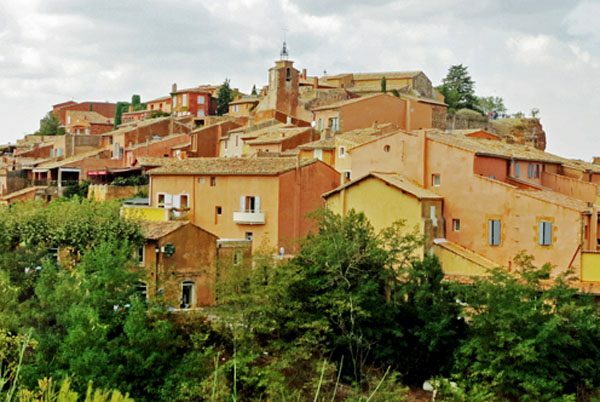 But what’s most special and memorable about Roussillon? COLOR! 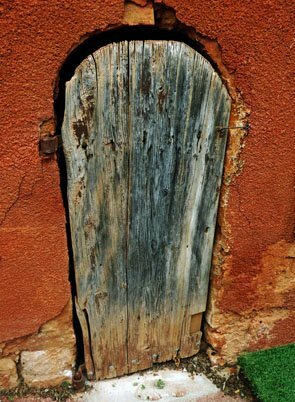 The incredibly vibrant colors are the result of its location in one of the largest ochre deposits in the world. 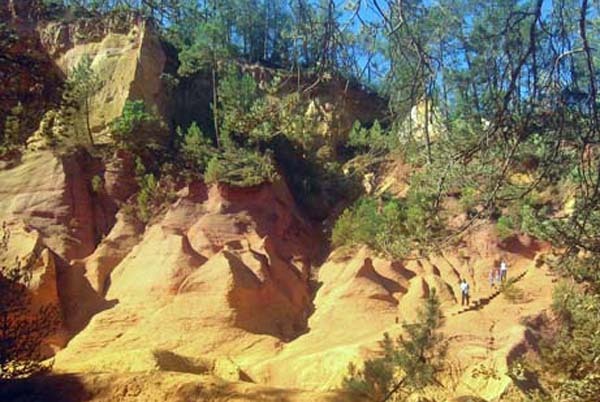 During the 18th and 19th centuries, ochre mining and processing was a major industry in this area, providing non-toxic dyes. The industry was phased out in the early 20th century as synthetic dyes were developed. 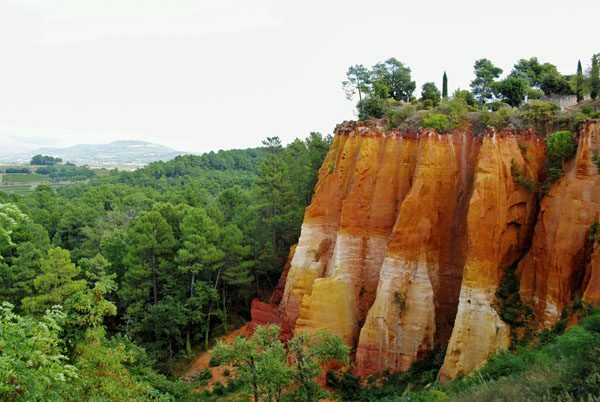 As we drive up to the village on the road, we begin to see red in the soil and then pass ochre cliffs. Everyone quickly realizes that this village is very different! Charley and I like to park around the north side of the village, away from the tourist bustle, and walk with our groups to the center on a quiet pedestrian street. 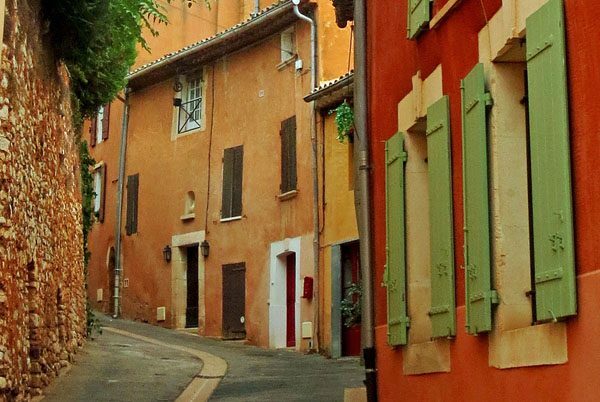 We peek up other residential streets, admiring the colors. 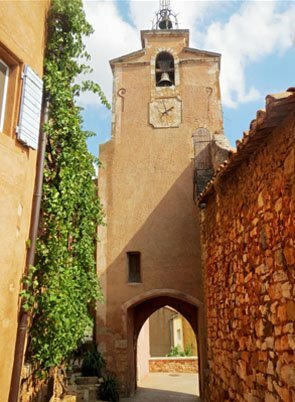 Finally we arrive at the Place Pasquier, the main square of Roussillon. A small market is held here on Thursdays. I especially like the row of houses in pastel colors. Nearby there’s a pharmacy, boulangerie, presse, butcher shop, post office, ATM, and a small grocery store, all important services for the local residents. 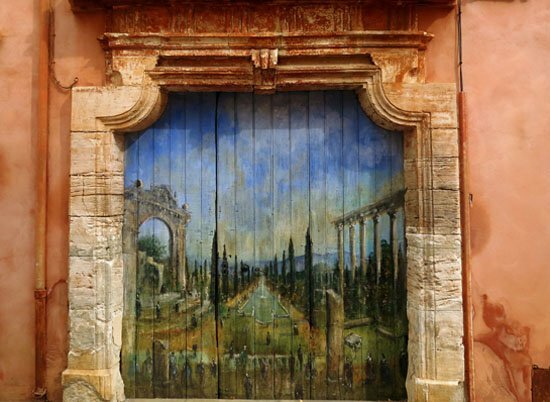 We make our way to the narrow pedestrian street, Rue Casteau, passing an ornately-painted doorway, one of the most photographed spots in the village. 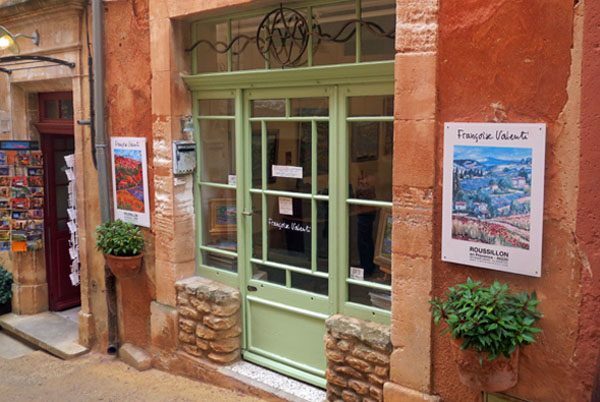 One of our favorite places in Roussillon is the gallery of our dear friend Françoise Valenti. We love her colorful art, and she always offers such a friendly welcome. Soon we reach the Place de la Mairie, named for the town hall that’s located here. This busy, attractive square is filled with restaurants and cafes. It’s a “lunch on your own” day for our travelers, and there are many choices here. But it’s not lunchtime yet. We continue on up the hill. Passing under the tall clock tower, we look back to admire its height. 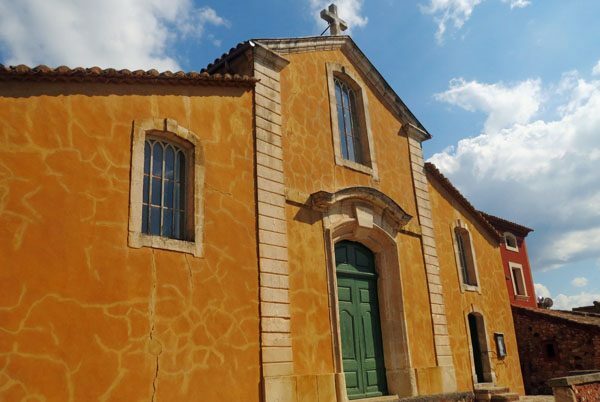 The church is near the top of the village, distinctive among churches in the Luberon in its size and shape and of course its color. Beyond the church, we pause on a terrace to look back across the village, all the way to the cemetery on the opposite hillside. Just a little higher up and our path comes to an end at another wide terrace, this one facing north. From here we have a 180 degree view of the surrounding countryside: villages, hamlets, farmhouses, vineyards, orchards and low woodland, with the hills and mountains stretching beyond. We’ve built up an appetite and head back down the hill for lunch at one of our favorite cafes. Later we’ll walk back down the little pedestrian street, Rue Casteau, to visit one last time with Françoise. Our group meets up near the pharmacy, eagerly sharing stories of their special lunches and discoveries and showing off their purchases. Together we retrace our steps through the lower village, savoring our last looks at this most unique Luberon village. 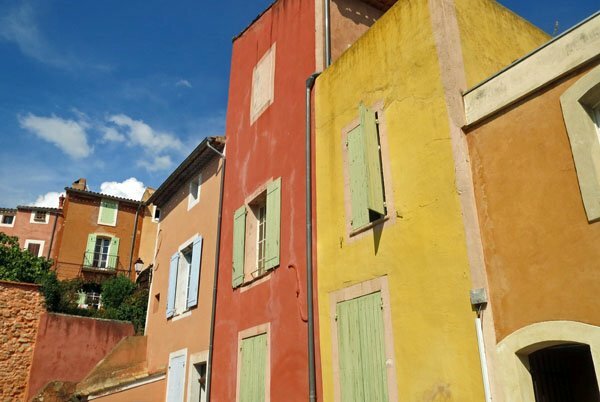 Experience colorful Roussillon and so much more of the beautiful Luberon with us on our Luberon Experience weeks in 2017! We’re offering trips next year in May and September. We’d love to have you join us! 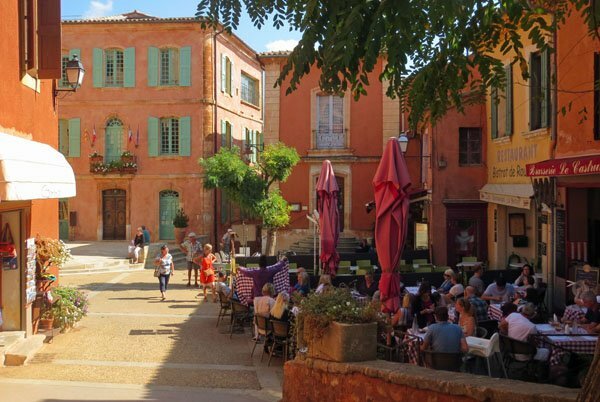 Hi Kathy, thank you for the reminder …I loved my two visits to Roussillon, and hope I will have a third sometime. Especially loved my visits to Françoise Valenti … next visit I WILL buy at least a poster. 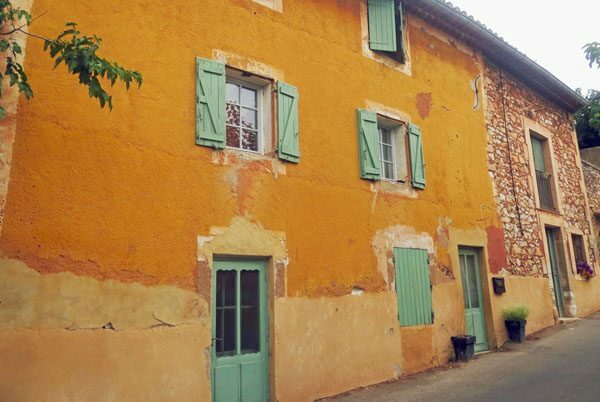 Last time Françoise told me she sells a lot through a Brisbane gallery..sadly the name has leaked out of my memory bank … not that I would go up there to buy, much rather do so at the source .. 🙂 The colours in the village are very special, and I do enjoy your photographic reminders. Sandy.